Hugo spent two days carving with us back in the Autumn and popped back last weekend to finish off his project. 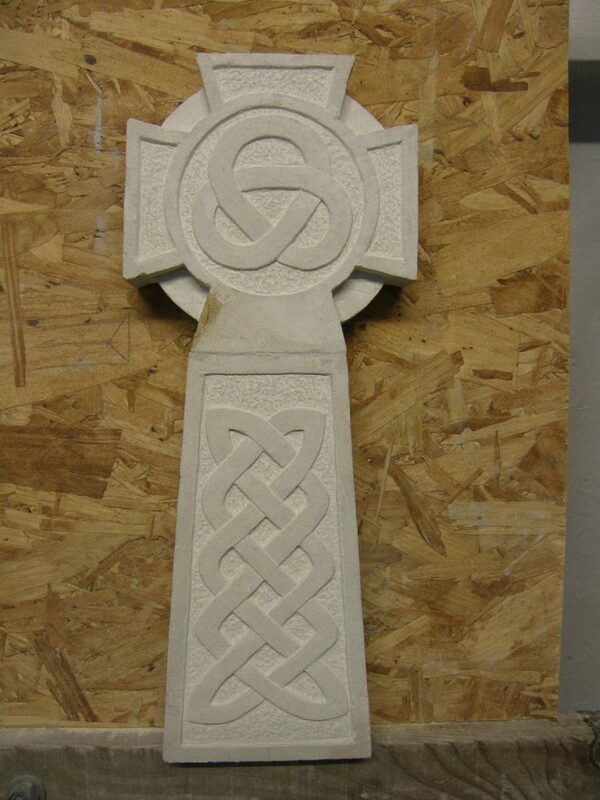 He’s made a really skillful Celtic cross that will be gracing his garden in Lostwithiel. Pete roughed out the base of the cross, the rest of the work is all Hugo’s. The knot work has really good precision and crisp lines and a pecked background texture that looks very effective. Hugo had not tried carving before and his piece demonstrates what can be achieved with a bit of hard work and determination! Peter also joined us for a day last weekend – for a taster day given as a Christmas present. He decided to make a house number for his parents and give it back to them as a present. Peter achieved a very professional looking lettering piece, spelling out ‘NINE’ in letters based on the classic Trajan alphabet. We hope to see Peter back before too long, and his dad might be paying us a visit too!